Madhavi combines a rigorous intellectual approach and formidable court room style with an approachable and compassionate manner. Her practice involves representing high net worth individuals including, by way of example, an internationally acclaimed artist; a former premiership footballer; an eminent QC; and a TV soap opera star. She has also represented a multi-national company, CEOs and captains of industry. Madhavi has particular expertise in cases with a Dubai element. To such cases she brings a firm grasp of the payment structures regularly employed in the UAE and a sound understanding of the cross-jurisdictional issues involved. Financial Remedy proceedings, Private Children matters, Domestic Violence and Cohabitants’ disputes. Mansfield v Mansfield  EWCA Civ 1056: one of the leading authorities on the treatment of personal injury awards in the context of financial remedy proceedings (led by Richard Todd QC). A v L  EWHC 3150 (Fam): Madhavi has appeared on her own in the High Court in an appeal hearing before Mr Justice Moor concerning a significant departure from equality. She has experience of divorce litigation at every level, from the Family Court, all the way up to the Supreme Court, where she assisted Richard Todd QC and Geoffrey Kingscote in Granatino v Radmacher  UKSC 42, the landmark case on prenuptial agreements. Madhavi studied at the Henrietta Barnett Grammar School for Girls before reading Law at the London School of Economics and Political Science. She was called to the Bar in 2008 following successful completion of the Bar Vocational Course at the College of Law in Bloomsbury. 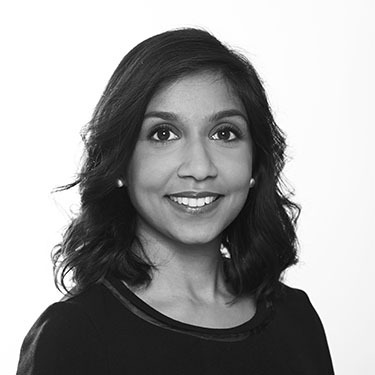 Madhavi undertook pupillage in 2009-2010 under the supervision of Geoffrey Kingscote, Justin Warshaw, now QC, and Rachel Spicer. Madhavi is an avid theatre-goer and enjoys seeing the latest West End plays. Madhavi also enjoys travelling and has recently returned from three weeks travelling in Japan.